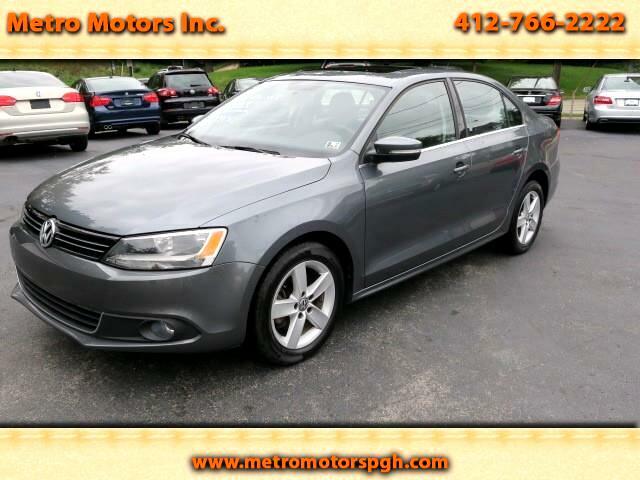 Used 2011 Volkswagen Jetta TDi for Sale in Pittsburgh PA 15202 Metro Motors Inc.
Pristine 2011 Volkswagen Jetta TDI Turbo Diesel. Finished in Platinum Gray Metallic, with Black Leather Interior. Garage Kept, Like New with 64,680 CERTIFIED MILES!! 2.0 Liter Turbo Diesel Engine that has the performance of a V-8 Engine and gets 40 mpg Highway! These cars run with care for 300,000 miles!! Low maintenance, Safe, Reliable, Economical getting 40 mpg highway!! This 1-Owner, Garage Kept TDI looks new inside and out!! Automatic Transmission. Climate Control. Premium Sound with CD, Satellite, And Auxiliary input. Navigation System. Key less Smart Key System. Power Glass Moon Roof. Heated Seats. Traction Control. Fold Down Rear Seats. Surround Air Bag System. Full Power. All Original Books, Key Fobs., and copy of Extended VW Warranty. This car just went thru VW's Diesel Updated Certified New Emission Guidelines, receiving updated Engine Computer, Sensors, and the lasted Catalytic Diesel emission update! This car has a VW extended warranty for 10 Years, 125,000 Miles on anything with the engine!! with "0" Deductible at any VW Dealer!!!! It is also transferable at any time.This is a great buy for a longevity car with an Awesome Factory Warranty!! Clean Auto Check History Report showing NO ACCIDENTS OR ISSUES!! One of the Smartest buys in the used car market place! !